Posted on Thu, Jan 26, 2012 : 11:47 a.m. Even with only five ingredients, this soup packs a ton of flavor. According to the people who arbitrarily assign holidays, January is National Soup Month. While I’m not usually a big celebrator of made-up holidays, this is one I can get behind. Who doesn't love soup? Soup is as soothing as a warm blanket on a cold winter day. Have a cold? Eat some soup. Don't know what to make for dinner? Go the Medieval route and throw together a pottage with your leftovers. Soup's got a lot going for it. It's usually cooked in one pot (minimal cleanup), can often be made quickly (great for last-minute meals) or can be left to cook all day in a crock pot (your house will smell amazing when you get home from work). I've been on the hunt for a good broccoli soup recipe — ever since I accidentally discovered that my 9-year-old would eat broccoli as long as it's been cooked well past the al dente point. Making soup from it seemed to be taking the broccoli to its logical conclusion. I found this broccoli soup on the Stone Soup food blog, a fun new find. Stone Soup's mission is to share healthy and delicious recipes which feature five ingredients and can generally be prepared in 10 minutes. I'll be bookmarking that site for further exploration, especially after whipping up a batch of this soup. I'm a sucker for anything with curry and coconut milk, it turns out. And this soup is no exception. I cooked up a batch on Sunday morning, intending to serve it for lunch. But after filing the house with delicious aromas, there was no way we were holding out that long. You can count this as the first time I've eaten broccoli for breakfast. And frankly, if you were to offer me a bowl of this soup, I'd do it again. If you’re dealing with a nut allergy, you can replace the peanut butter with a dash of fish sauce and some sugar. You can also choose a different flavor of curry paste if you feel like experimenting. Red curry could work well. And if you've got some basil in the kitchen, sprinkle it over the soup before serving. 1. Heat a large saucepan on a medium-high heat. Add a few tablespoons of cream from the top of the coconut milk or some oil. Add the curry paste and stir for 15-30 seconds or until you notice the aroma. Be careful not to burn. 2. Quickly add 3 cups water and the rest of the coconut milk. Bring to a simmer. 3. Add broccoli. Bring back to a simmer and cook uncovered for 10-15 minutes or until the broccoli is tender. 4. Remove from the heat. Stir in the peanut butter. Taste and season with a little salt if needed. Blend in the blender or with an immersion blender, or leave it chunky if you prefer. Serve immediately. Fri, Jan 27, 2012 : 10:15 p.m. I was going to try this until I saw it had peanut butter in it. Yuck. I like peanuts, but peanut butter turns my stomach. Other than fish sauce (no problems with that; I just don't keep it in stock), what are some other possible substitutes? Fri, Jan 27, 2012 : 12:21 a.m.
Just this morning, I made a South Beach Diet dish called, &quot;Coconut Chicken,&quot; calling for coconut milk and tamarind paste. I substituted red curry paste (I'd used up green curry paste a few weeks ago). So I got to wondering about those ingredients with broccoli instead of with boneless chicken. It would be easier to cut up broccoli. Fish sauce a substitute for peanut butter? I thought I saw just today some article title suggesting it; I'm sure it wasn't yours. But it does remind me of a true story I read years ago about two young Vietnamese brothers brought here by an American couple, who had to teach them American cuisine. Before the boys left their homeland, the American couple introduced them and other children to peanut butter, which they called &quot;brown paste.&quot; In their early days here, the boys' breakfasts included fish sauce, like they always used in Vietnam. Then they got used to eating Cheerios and Wheaties for breakfast. But never did the idea of substituting peanut butter for fish sauce or vice versa enter the true story, titled &quot;Sudden Family&quot;. Thu, Jan 26, 2012 : 5:59 p.m. 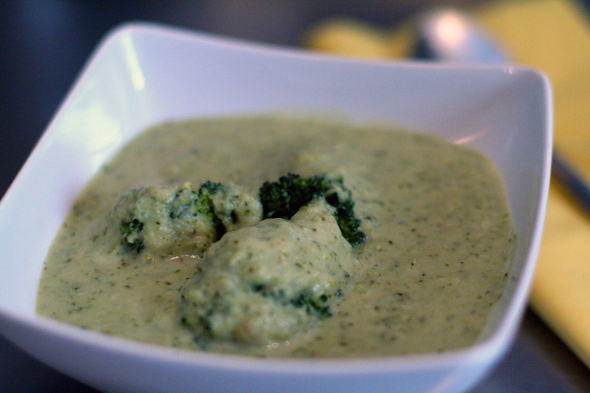 Broccoli and green curry would cause havoc on my digestive system!